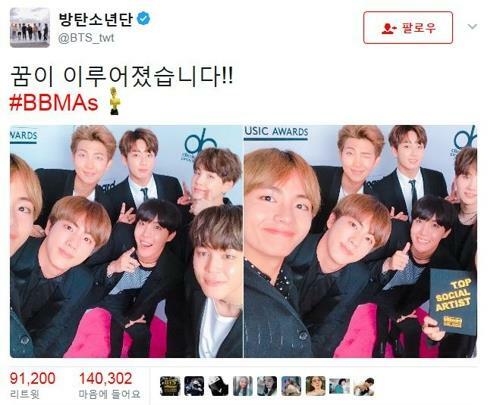 SEOUL, May 22 (Yonhap) — South Korean boy band BTS, also known as Bangtan Boys, has won a Billboard Music Award, becoming the first K-pop group to be honored by the global awards. 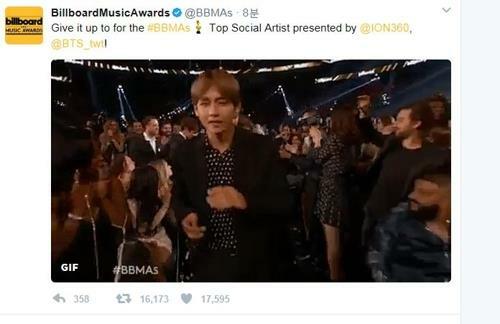 On Sunday local time, the popular K-pop idol received the Top Social Artist award at the T-Mobile Arena in Las Vegas. The seven-member group beat Justin Bieber, Selena Gomez, Ariana Grande and Shawn Mendes, who were nominated in the category. Upon receiving the trophy, Rap Monster repeated that the group was so thankful for all the supports and love from fans around the world and that they would do their best to become a better group. The winner was chosen based on album and digital song sales, streaming, radio airplay, touring and social engagement for one year starting from March 18 last year, as well as the result of a global online vote by fans, the awards organizer said. This marked the first time that the ceremony actually took place on stage. Since the category first started in 2011, the winner had been announced on a website. The seven-member group has a strong presence on Twitter and Instagram. In March last year, Forbes named it the most retweeted artist. Four albums by the group, including “Spring Day” and “You Never Walk Alone,” cracked the Billboard 200, an astonishing achievement for a K-pop group who sings in Korean and rarely promotes its albums in America.